We met with you at a clinic held at Lorraine Dearnely’s yard in New Milton on Tuesday 5th April. My daughter Milly, and her pony River were having trouble with brakes, and you suggested she try the Doubler leverage, and you put on a jaw strap. I wanted to let you know that the results have been brilliant, and we are over the moon. River has been so much happier, and calmer. But the best of all is that Milly feels so much more confident, she happy to ride him forwards without the worry that he’s going to run, she’s hacking and doing double clears at a 2’6” class when she hadn’t even done a full 2’6 course before. And she is taking him to PC senior camp for the first time, happy that she can control him. So thank you. I have used Hilary's expert advice and bits for a few years now and every time I need her help she comes up with some brilliant Bitting solutions! Each of my horses have over the years had many problems as to which bits were the best and I always ended up switching and changing all the time until Hilary came to the rescue! Now I have all my bit problems sorted, she took a lot of time making sure my boys were happy and what suited each one individually the best and since then we have not looked back. Our competition results speak for themselves and the best part is that Hilary is always at the end of the phone for advice if we come across a new problem!!! Thanks Hilary! My mare had always been fine in a snaffle - until she had a few years off due to injury and having a foal. 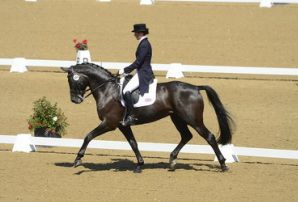 When she returned to dressage - she was rather dominant, feisty and could nap, rear and spin. In a snaffle I had very little control and although when Violet felt like it - she could go very well, if circumstances were NOT to her liking - she could be dangerous. I tried schooling her in a Pelham - which worked really well and restored my level of control - but of course - not being BD legal - was useless for competing. Therefore her training at home was getting better and better, but our scores at BD were always a disappointment. I tried every super expensive and super well recommended double set on the market - she hated all of them. Refused to move, ears flat back, backing up ready to rear or bronc. My trainer then suggested having a session with Hilary Vernon. I was a little dubious, as I doubted that there was a double in existence that my mare would happily accept. However, after a very calm and unobtrusive session with Hilary - Violet was introduced to a snaffle, that was also suitable to be used as a bradoon. Seems a bit silly - but I actually had a little tear, when my mare suddenly trotted happily around the arena, as if a handbrake had been taken off! I purchased this bit and then under Hilary's advice spent the next few weeks hacking and lightly schooling in it, with no pressure. On our second clinic with Hilary - a Weymouth was added to the bradoon to make it a set, which was instantly and without hesitation accepted by my mare! Again Hilary advised that I hacked out and lightly schooled for a few weeks in the double set, to allow Violet to get used to it. I was actually a bit naughty and ignored this advice and we competed in our first ever elementary 2 days later. Violet was amazing, totally settled in her head & mouth and came 2nd. Claire Pemberton BHSAI ITEC ESMT SMT Hol.M. Anat & Phys dip. I have known Hilary Vernon for many years now, and she plays an important part in the wellbeing of my horses. Before I knew Hilary, I spent many years searching unsuccessfully for the right bit for my eventer. We asked Hilary to come over for a bitting day & we have never looked back. 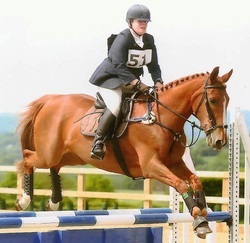 Not only has she successfully re-bitted my eventer mare, but she has transformed the rest of my 5 horses, along with several of my clients horses as well. Hilary Vernon has a wealth of knowledge of bits and mouth conformation, along with experience of which bit suits individual temperaments. She not only fits suitable bits to the horse, but also ensures it suits the rider too. I can also highly recommend her for saddle fitting, and she has fitted all of my horses for saddles. She is a true professional in every way, & I fully trust her opinion & expertise with any of my horses. We will continue to hold bitting days for Hilary’s consultation clinics.